Two women have been accepted as coopering apprentices by drinks giant Diageo for the first time. 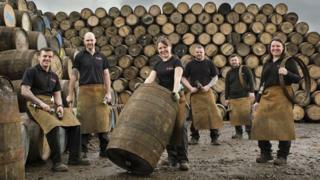 The women, who are part of a group of 16 new apprentices, will be taught the ancient craft of creating oak casks for whisky. Diageo said Angela Cochrane, 31, and Kirsty Olychick, 38, were helping to break down gender barriers. They will be based at Diageo's Coopering School at Cambus, Clackmananshire. The four-year apprenticeship will feature a mix of theory and hands-on experience. Ms Cochrane, a former psychiatric nurse, said she discovered coopering after spotting an advert on Facebook. She said: "I researched a bit about the trade online and thought it sounded like a really interesting career option, so I knew I had to go for it. "It's a lot more complex than I thought it would be and I'm knackered when I get in at night but everything from handling the barrels to swinging the hammer is already starting to feel a lot more natural." Ms Cochrane said she has never been put off by gender stereotypes and added: "I don't think that should stop anyone from doing what they want to do." Ms Olychick, 38, crossed the Atlantic to pursue a career in the Scotch whisky industry. She said: "I've always been inspired by the Scotch industry, so it is something I've always wanted to be involved in, but living in Canada I hadn't ever been exposed to the coopering craft. "Having family members who'd previously completed trade apprenticeships helped give me the confidence to go for it. "My dad always told me that if I had an opportunity to get into a trade I should jump on it." Ms Olychick said she was thrilled about the challenge ahead. She added: "Coming into a male-dominated workplace didn't put me off at all, in fact I found it really empowering to be one of the first women to take up the craft and make my mark in history. "It's such an exciting prospect to think that I'll be contributing to the next generation of Scotch. You shouldn't let anything hold you back." Coopering tutor John Carberry has more than three decades' experience and said the role required "incredible precision". He added: "Our apprentices need to master a blend of strength, skill and patience, learning how to hand repair casks with no glue or nails, as well as calculate different oak depths, ratios and specific measurements. "The traditional coopering skills take 10 years to master but once mastered, it's a rewarding career which will last a lifetime." The £10m Cambus Cooperage opened in 2011 and produces more than 400,000 casks a year of mature spirits from Diageo's portfolio of single grain and single malt distilleries.